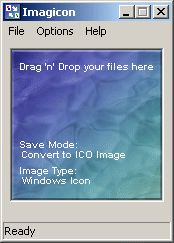 Imagicon converts images to icons or smaller images. When set to save to ICO format, users can drag-and-drop regular images to create square icons in 16 x 16, 32 x 32, 48 x 48, 64 x 64 or 128 x 128 with transparency support. For images, BMP, JPG or PNG image files can be saved to smaller, higher-compression versions with basic transformation effects (flip vertical or horrizontal, conversion to black and white), useful for creating thumbnails. Fixed Anti-Virus 'false positive' detection issue. I have used this program lots of times on several computers with no problem. I am on this site because I could not find the program on this computer, so I re-installed from from a previously downloaded file. My AVG antivirus program flagged the executable as dangerous, and removed it. It is a great program, and I have no idea why it was flagged, as it never had been before. I am going to delete my old download, and download it again. I am using XP on all present computers, and I do not remember if I was using it with Win98, which I continued to use until a couple of years ago. Working greatly here on my XP Pro SP2, since first install. No quirks of any kind. I tried this program on two XP computers. The window appears and quickly disappears. The program doesn't even work when you just try to install it to the hard drive.